Factory 506: Take a Note! Have you ever considered chalkboard paint? I painted a small wall outside of my son's room in chalkboard paint. ORANGE chalkboard paint, to be exact. We love it and most of the children who come over love it too! It seems someone (mostly me) is always doodling or writing something on it! 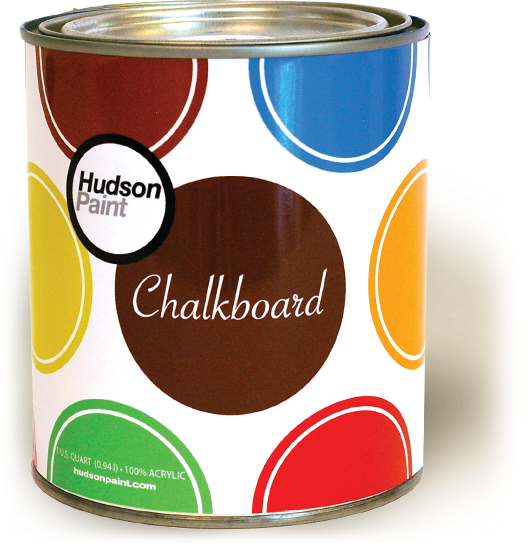 I know there is a ton of chalkboard paint out there, but this is the one that I used. I just fell in love with all of their color options, and it is so easy to use. I was considering the bakery green but ultimately decided on the safety orange, and it is awesome. It is literally the color of a traffic cone! The white chalk shows up really well, and it is bright enough that the wall does not seem dark. And look at that polka dot can, seriously, how could I NOT use it!? Hudson paint also makes a floor paint that I am seriously considering. I am giving the floor in our bedroom the side eye, I think paint might be in it's future! Would you ever paint a chalk board wall in your house? Guess what, it is not as dusty as you might think!